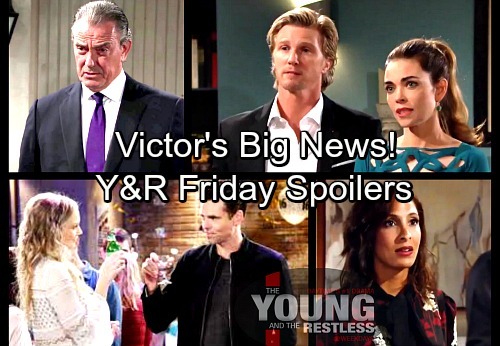 The Young and the Restless (Y&R) spoilers for Friday, March 9, tease that Victor (Eric Braeden) will reveal the conclusion he’s come to. After doing some digging, Victor shares big news with Victoria (Amelia Heinle) and J.T. (Thad Luckinbell) on Thursday. He thinks he knows who’s behind the leaked documents that ended up in Jack’s (Peter Bergman) hands. Will Victor believe it’s Victoria or Ashley (Eileen Davidson)? There’s no confirmation yet, but some other Young and the Restless spoilers could serve as huge clues. Y&R fans can expect Billy (Jason Thompson) to step up for his sister on Friday. He’ll do whatever he can to clear Ashley’s name. Of course, Abby (Melissa Ordway) will want to pitch in on this as well. Since she vows to help in Thursday’s episode, it’d be a waste if the whole thing was resolved before she had a chance. The Young and the Restless needs to get a little more drama out of this storyline. Victoria should get caught eventually, but maybe Ashley will go down first thanks to the sneaky setup. Billy and Abby might team up to get Ashley out of this mess. They could conduct their own investigation and hopefully find proof of what really went down. The Young and the Restless spoilers say Victoria and Ashley’s war is far from over, so expect more insults to be hurled and threats to be delivered. For now, Victor will try to protect his company. It looks like Victor will be ready to cut ties with anyone he believes it guilty. That could include Ashley and anybody else he suspects was involved. Across town, Devon (Bryton James) will work on a happier undertaking. He’ll jump at an opportunity that could take Hamilton-Winters to the next level. Now that Lily (Christel Khalil) is looking for a job, she’d be the perfect person to oversee some projects. The Young and the Restless spoilers say Lily will take on a brief modeling gig in New York, but she’ll need something more permanent when she returns. Bonus points if Lily gets to supervise Hilary (Mishael Morgan)! Trouble could be brewing if these two are forced to work together. It sounds like some intriguing situations are ahead on the CBS soap. We’ll give you updates as other details emerge. Stay tuned to Y&R and don’t forget to check CDL often for the latest Young and the Restless spoilers, updates and news. The Young and the Restless Spoilers: Y&R Ends Complex Arc With Outrageous Chelsea Write-Out – Adam Newman Fans Cheated?